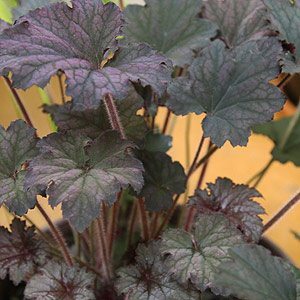 Hardy and a good plant for part shade, Heuchera’s will grow well in the garden as well as in hanging baskets. Some do like more sun than others so choose wisely and they will thrive with little care. Although we mainly see cultivars for sale, species such as H. ‘citronelle’ will actually grow and flower in fairly deep shade. Part of the Saxifragaceae family and with a large number of species available Heuchera perform a useful task and are easy to care for in the garden. Heuchera have colorful foliage and are heavy flowering. Best described as a ‘clumping perennial’ all varieties do well in the border or in a pot as a specimen plant and are great plants for edges and borders. 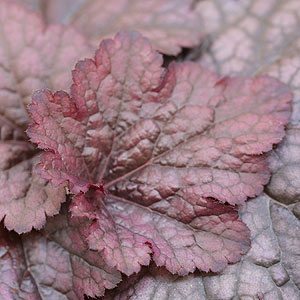 Heuchera ‘Amethyst Myst’ (picture right) is loved for the burgundy foliage. Easily grown in full sun or light shade, in a humus rich, well-drained soil. Some protection from hot afternoon sun is desirable. Deadhead after flowering to promote a second flush of flowering. 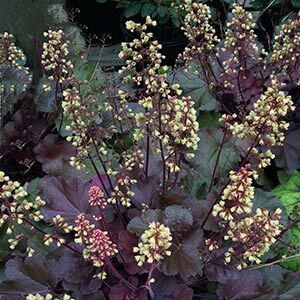 Heuchera make neat clumps with attractive foliage and provide an ongoing display of flowers. Consider planting in the rock garden or perennial border, or perhaps in a pot as a specimen. Evergreen in all but the coldest climates Heuchera are really an easy care plant. Given a humus rich well drained soil, moisture during summer and mulch to maintain a cool root run little maintenance is required. Some gardeners like to divide and replant every year or two to maintain freshness and vigorous growth. Division is best carried out in autumn or late winter. Heuchera ‘Raspberry Regal’ makes a good cut flower. H. americana ‘Green Spice’ and “Berry smoothie’ are also worth looking for.